The off-road Koenigsegg One:1 created by Yasid Design may not be an official model, but that won't stop you from wanting one. It's a 4x4 monster truck/supercar hybrid version of the $7.4 illion Swedish built Koenigsegg One:1 (see vid above of the stock hypercar in action) and it wouldn't look out of place in a Mad Max movie. The Koenigsegg One:1 (called the "world's first mega car") is a 1360kgs (the world's first car to produce over 1 Horsepower per kilo) beast of a machine with a top speed of 273mph and, according to the Top Gear website, can go from 0-100km/h in 2.8 seconds, 0-300km/h in about 12 seconds and 0-400km/h in 20 seconds. There was only six of them created, they cost a king's ransom, and they've all been bought up, in case you wanted one. Still, you never know Koenigsegg may be inspired and actually make the Yasid Design version. The designer, who runs a "automotive design and consultancy studio," took inspiration for it from the off-road racer prerunner trucks that run a race course before the event to scout it out. 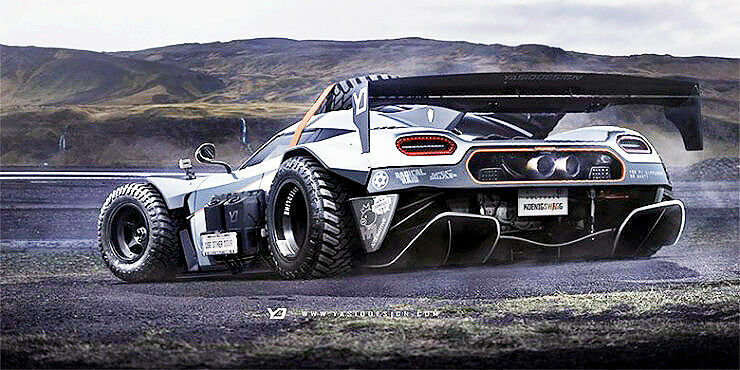 "It might seem too low or dropped to be an off-road Koenigsegg One:,” Yasid told Top Gear. “But the explanation is simple: I like to think it’s not in off-road mode. It’s simply a road mode/show mode,” he explains. Posting an image of the crazy 4X4 hypercar to the company's Facebook Yasid captioned it "Koenigsegg One:1 on some offroad shoes. And Steroids. Don't look away purists." So just to be concise and keep you in the loop, it's a $7.4 million Koenigsegg One:1 that has monster truck style wheels and tyres, an epic rear wing, widened arches, diffuser, and a huge spare tyre strapped on the roof. “I am always very interested in taking high end supercars and hypercars and tampering with them, to see what we can come up with,” Yasid explained. “This offends a lot of purists, but it’s somehow one of the things I personally like to do – the things that you would expect the least”. It'sinsane, but you kinda want it to happen. Check out more of Yasid Design's custom creations at their website or Instagram. And take a look at the video below as a stock Koenigsegg One:1 sprints from 0-300-0km/h in an amazing 17.95 seconds.